At least 24 people are dead, including 9 children, after a massive tornado swept through the suburbs of Oklahoma City Monday. The tornado was estimated to be at least two miles in diameter at the height of its powers, with winds up to 200 mph. Emergency personnel have so far rescued 101 people from rubble in the Oklahoma City metropolitan area. At least 7 of the 9 children killed were at Plaza Towers Elementary School in Moore, just south of the Oklahoma City area. The school took a direct hit from the storm with many children still inside. Oklahoma Lt. Gov. 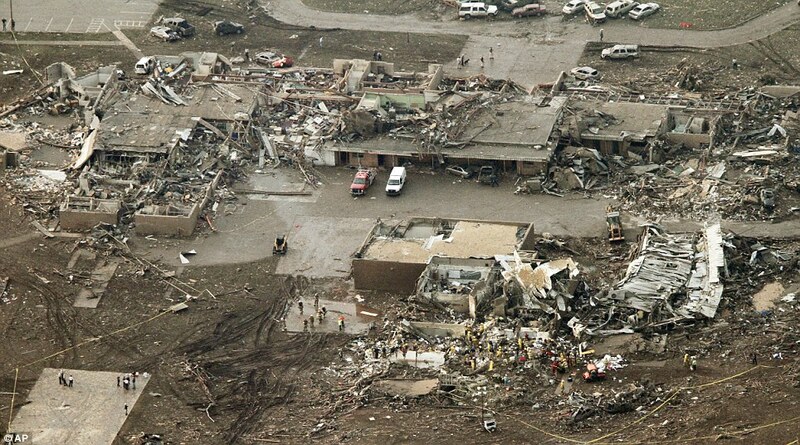 Todd Lamb told CNN that some of the children killed at Plaza Towers likely drowned in the basement during the storm. Emergency personnel in the metropolitan area have pulled 101 people from the rubble so far and are continuing to search for survivors as of Tuesday morning. Moore, Oklahoma Mayor Glen Lewis told CNN Tuesday that they are optimistic that they “might find one or two people." President Barack Obama signed an order declaring the Oklahoma City suburbs a major disaster area, and has diverted federal aid to supplement state recovery efforts in the area. Severe weather is expected to continue in the area with hail, severe thunderstorms, and more tornadoes.